ANAKIN follows, and OBI-WAN cuts his young apprentice at the knees, then cuts off his left arm in the blink of an eye. ANAKIN tumbles down the embankment and rolls to a stop near the edge of the lava. ANAKIN struggles to pull himself up the embankment with his mechanical hand. His thin leather glove has been burned off. He keeps sliding down in the black sand. ANAKIN : I hate you! OBI-WAN: (continuing) . . . You were the Chosen One Anakin! It was said that you would, destroy the Sith, not join them. It was you who would bring balance to the Force, not leave it in Darkness. OBI-WAN picks up Anakin’s light saber and begins to walk away. He stops and looks back. OBI-WAN: You were my brother, Anakin. OBI-WAN (continuing): I love you but I cannot save you. 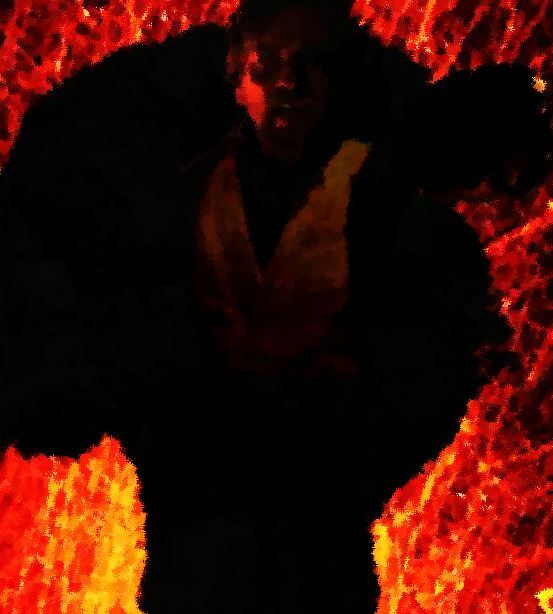 ANAKIN’S clothing blows into the lava river and ignites. Suddenly ANAKIN bursts into flames and starts SCREAMING. OBI-WAN looks in horror as ANAKIN becomes engulfed in flames. OBI-WAN can’t watch him as he struggles to climb the embankment, covered in flames. He runs back to Padme’s ship as ANAKIN drops, smoldering, near the top of the lava pit. I often question myself. Some people say I think too much. Indeed I tend to think my way in to “What if” Land a fair bit. That is the hall mark of a true alcoholic. “What If” is a proposition I often put to myself. I construct hypothetical scenarios and fantasies. Alternate lives and endings are imagined. “What if” my mother had not died when I was a child, what if my childhood had been “normal”, what if I had never started drinking, what if I’d stayed in the army, what if I’d chosen another partner, settled in another country or chosen another career, another path in life? What if I had kept drinking past my rock bottom and found it was only the first of the 9 circles of Hell? “What if” Lucas had followed a twisted idea he had for a dark ending and handed the final victory to the Sith in “Return of the Jedi”. At the final scene Luke stands over the body of Darth Vader. We see the face of Luke a mask of confusion and grief instead of compassion and empathy. A shadow passes over him and his demeanor changes and his face hardens. Stooping down he removes his Fathers helmet and places it on his head. Finally embracing the Dark Side that resides within, Luke proclaims himself the Master, the new Darth Vader. The “Imperial March” plays, the scene fades, credits roll….People stagger out the theater shocked, dazed and confused. What just happened? The idea was quickly rejected. Lucas went on to produce a “Happy Ending” finale. Kids everywhere loved the Ewoks and the movie became a family classic instead of a dark tale of revenge and betrayal. We would have to wait twenty years to see the adorable child Anakin grow to become a mass murdering monster. More than a decade after “Revenge of the Sith” and we meet the deranged yet awkward son of Han Solo and Leia Organa; Kylo Ren. Everyone knows how the battle between Anakin and Obi-Wan played out on Mustafar in “Revenge of the Sith”. Anakin had his legs and arm cut off and was left to die, a lost cause, by his Master. In the deleted and alternate scene on Mustafar, Anakin comes to his senses momentarily and pleads for help. The voice was edited out of the final cut but you can still see Anakin voice “Help me, Master” with pleading eyes. Obi-Wan refuses and Anakin’s face contorts in to rage and hatred as his eyes turn yellow and red. Obi-Wan abandoned Anakin to his fate at his moment of need. Despite everything that Anakin had done, the atrocities he had committed, there was still a spark of humanity in him. There was still a chance he could be saved. Anakin had called to his Master to help him come back from the brink. Lost in his own emotions of anguish, fear, disgust and righteousness, Obi-Wan failed a test of character thus condemning Anakin to his personal hell and the Galaxy to the Sith. Obi-Wan’s failure as a Jedi Master and his betrayal as a friend and mentor proved Anakin right about the Jedi. I will never view the scene the same way ever again. It will play in my mind “As if” it happened not as a”What If”. “Help me, Master” makes “Revenge of the Sith” so much more a tragedy than it already was. Lucas was wise not to include such a final and tragic twist in the movie. It would have been too dark and left the world in a worse place. But “What if” he had? The revelation of the deleted line explained a lot of things in my mind; Darth Vader’s thirst for revenge, his quest to find Obi-Wan Kenobi. The cover up of Kenobi’s failure and betrayal of Anakin from Luke Skywalker. Perhaps it even spurned Obi-Wan’s willingness to finally face Darth Vader and free himself from physical existence by leaving himself open to Vader’s fatal blow. Perhaps his final act on the Death Star was a form of self redemption and reconciliation with a past that haunted Kenobi over the decades he waited in exile for an unknown fate. When it came, he embraced it with open arms. Star Wars is a constant reminder that the most unexpected twists in fate do happen. The possible alternate endings Lucas could have chosen for the stories are limitless. 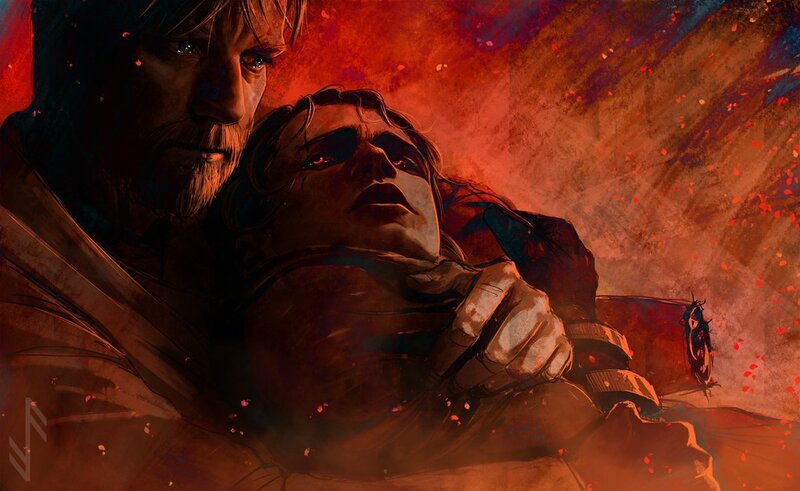 “What If” Anakin had come back from the brink and called to Kenobi to save him as he lay burning in anguish on Mustafar? “What if” Obi-wan had returned and lifted his friend up and saved him from the final fall? Carrying him on his shoulders, redeeming himself and Anakin. In the end, Luke Skywalker did exactly that in “Return of the Jedi” redeeming Darth Vader instead of killing him and claiming his helmet, embracing evil and assuming the title of Sith Master. Luke not only saved his Father he saved himself. That was his destiny. “What if” Obi-Wan ignored a desperate cry for help and it created Darth Vader? That his action sealed the fate of billions of lives across the Galaxy? If you also include the stories from the Expanded Universe series one only scratches the surface of the realms of “What If” possibilities. It is fiction, a modern mythology but it is also the nature of reality. Our pasts are made up of “What Ifs”. “What If” can be a bind that tethers us to the past in remorse and regret. We become mired in the “What If’s” of our lives. Instead of learning from mistakes we define ourselves by them and ruminate endlessly on doors that opened and closed long ago. We pine over lost opportunities and the “one that got away”. It is the “What If” questions that challenges our assumptions or puts doubt to our life choices and beliefs. Your entire life is then up for revision, judgement and possible rejection. “What If” can however also be a powerful tool for change as it opens up an infinite array of possibilities if we are prepared to free ourselves now. “What if” can be the vehicle with which you inspire and drive change in your life. By putting the question “What If” in to the present context we challenge ourselves and spur action. Instead of digging up lost opportunities we suddenly create new ones. “What if” you take that job? Start training, eat better, get in touch with an old friend, go back to school, stop taking drugs, stop drinking, start meditating, learn a language, read more, spend more time outdoors, travel the world, be nicer to people, take a different view on life, love yourself more, take risks, live life…The list goes on. Only a decision to act on that “What If” is needed. The past is gone and no “What ifs” can change that. Do you choose to waste time and energy in regret or do you use the past to empower the present and build a better future? Instead of asking “What If, I had done things differently” ask “What If I start to turn things around now“? What “if” I change right now? “If I feel depressed I will sing.